With the Thanksgiving holiday fast approaching, my soul begins to sense a wonderful opportunity to reflect and become filled with gratitude over all of those precious and amazing gifts that I have in my life. When we’re in the midst of challenges, or when we’re simply running on what seems like fumes as we navigate through all of the must-do’s in our daily lives, it can be all too easy to place focus on what is uncomfortable, or what makes us stressed or overwhelmed. There never seems to be a shortage of problems in life, or of things that need our attention that only seem to deplete our mental, physical and spiritual reserves; those, somehow, always seem to be there in abundance. But in between those moments of challenge are those beautiful little jewels that shimmer and glisten in an almost unassuming way, that make life so very deliciously amazing and beautiful to experience; and those are what I want to remember and reflect upon, and what I want to be thankful for in this special and inspiring season. Just thinking back on certain moments in life when I’ve felt vulnerable or troubled, all that I really needed was a soft place to lay my head, or a tender ear to hear me out. All that my heart longed for was a connection, and to be understood and treated gently. And so I’m grateful to my husband for his amazing love, wisdom and availability, and his desire to be the best husband he can be for me; for offering me that soft place to rest when I desperately need it, or to remind me of who I really am, and to fix my eyes on my Creator who made me in that unique and special way. And when I’m wanting nothing more in a certain moment than to be a daughter, I’m grateful for my wonderful parents that have always shown such amazing love and support, such kindness, mercy and selflessness, and have provided me a place to go when it’s guidance that I’m seeking, and that special kind of unconditional love that a parent gives so very well. I’m so very thankful for my son, who offers me the vessel of his being-ness to fill with so much of the nurture that I have to give, and who’s very presence makes me happy and fills me with pride and joy, and utter amazement at the miracle of life that he most exquisitely is. And then I am reminded of my precious extended family that keeps us in their prayers; and of the wonderful people that are my clients that show me such beautiful tenderness and support through their glowing spirits, such that I have never experienced previously in a work environment; and to the casual friendships that I’ve made at the various stops that I make throughout my week for work, or for personal errands, that always seem to have a genuine smile and sweet, friendly disposition at the ready. Those are just a tiny handful of shimmering gems that my heart fills with gratitude over when I consider them. And the beauty of it is that they’re people, not things. They are real, living connections. So for this special upcoming holiday of Thanksgiving, may we all step back, for just a moment at least, and reflect upon who and what we have that makes our life that much brighter, or that much more special. May the challenges of our lives evaporate for just a little while, and be replaced with the heart-warming feeling of gratitude, and of really seeing what is true and beautiful; and may we see what there really is of precious value that perhaps we’ve been overlooking, that buffers us a little during our moments of struggle. -Preheat oven to 400°, and line a baking sheet with foil. -Toss the cubed sweet potatoes with a couple of drizzles of the oil, plus a couple of pinches of salt and black pepper, and roast for about 20 minutes, or until tender; allow to cool slightly until warm. 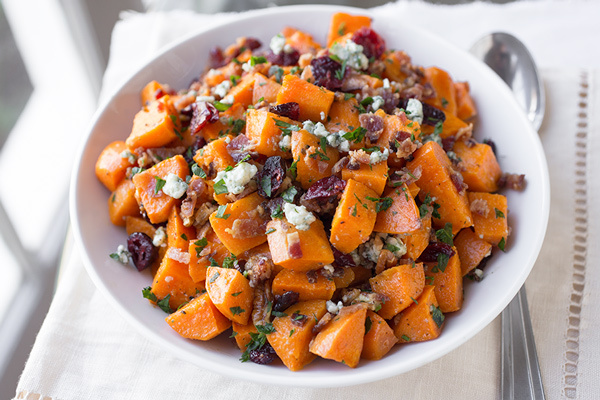 -Turn the roasted sweet potatoes out into a large bowl, and add in the chopped bacon, cranberries, blue cheese, pecans and parsley; drizzle in some of the Warm Bacon-Herb Vinaigrette, toss to coat, and check to see if any additional salt and pepper is needed. 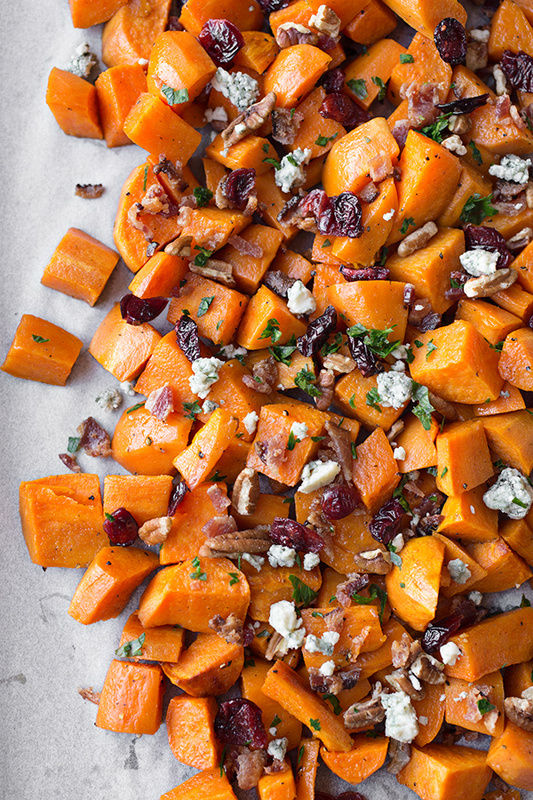 -Serve warm as a sweet potato side dish. -Add all of the ingredients up to and including the black pepper to the bowl of a food processor, and process until blended; with the processor running, drizzle in the oil until complete blended and emulsified. -When ready to serve, pour the vinaigrette into a small sauce pan and very gently heat for about 30 seconds or so, just until warm; then, drizzle as much as you’d like over the sweet potato salad. That last paragraph is so well said. Troubles are fleeting but investing in people is eternal. Thanks for the reminders, Ingrid. And this recipe looks wonderful. Love all the toppings! Julie, thanks so much for your kind comments. Really appreciate your sentiments! This looks so very perfect! I can’t wait to try it! This is a definitely perfect thanksgiving side salad. Even though we don’t celebrate thanksgiving here in Australia – I definitely will be making the recipe for myself. Thanks for sharing it.. looks delicious! I noticed that the recipe calls for shaved brussel sprouts, however, in the picture I don’t see any. Can you explain a little more? Are they supposed to be raw or sauted? Thanks! Looks amazing! Can’t wait to try this! 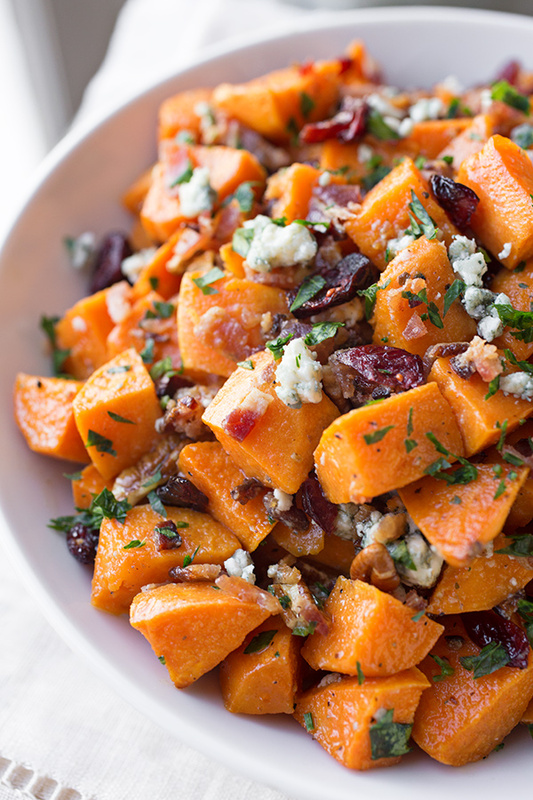 What do you think about using butternut squash along with the sweet potatoes? 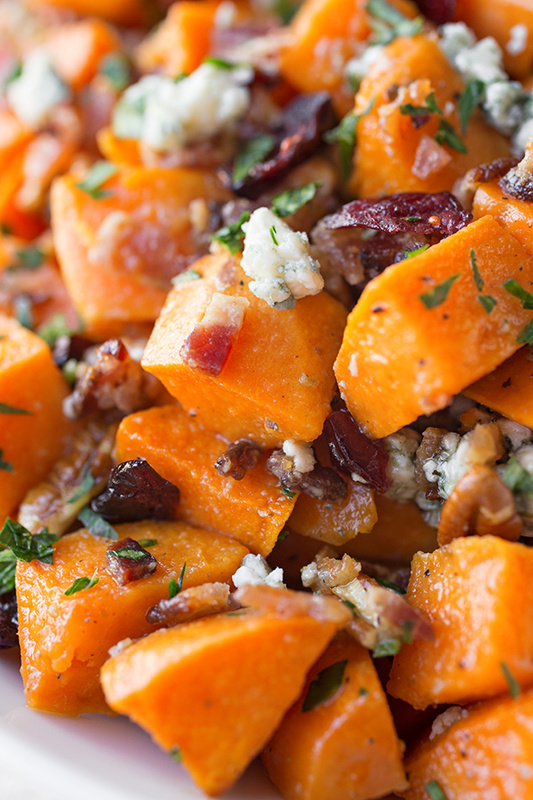 I was planning on roasting squash tomorrow but now I might have to make this instead! Can I make it ahead and serve it cold? Would that work, or would the bacon drippings make it weird? HI Karen, that should be just fine! See, you’ll use the drippings in the vinaigrette, and toss the salad with it; so once it’s been incorporated, you can keep it in the fridge and enjoy it cold, as well. I have been making this salad for several years for the holidays, but I add spinach to mine. If time is short, I just grab a jar of the marzetti’s spinach salad dressing and I am good to go. I was wondering if it would be totally gross to take out the blue cheese and add a goat cheese instead. 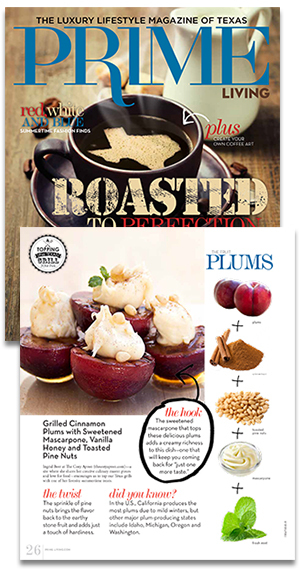 In addition, I wondered about adding some honey roasted beets? This recipe looks amazing. I’d like to leave out the bacon. I eat no meat. It was actually easy to give up bacon since I am probably the only person on the face of the earth who does not like it. BTW, I loved your Thanksgiving prayer. Ohmyword!! Loved this!! I did add leftover honey mustard chicken, honey crisp apples and homemade Boursin cheese!! 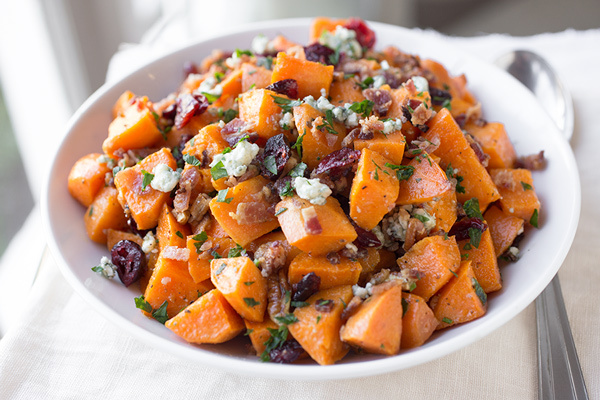 Thanks so much for a new way to use sweet potatoes! Lee, I’m thrilled you enjoyed this so much! Thank you for sharing your experience with it! 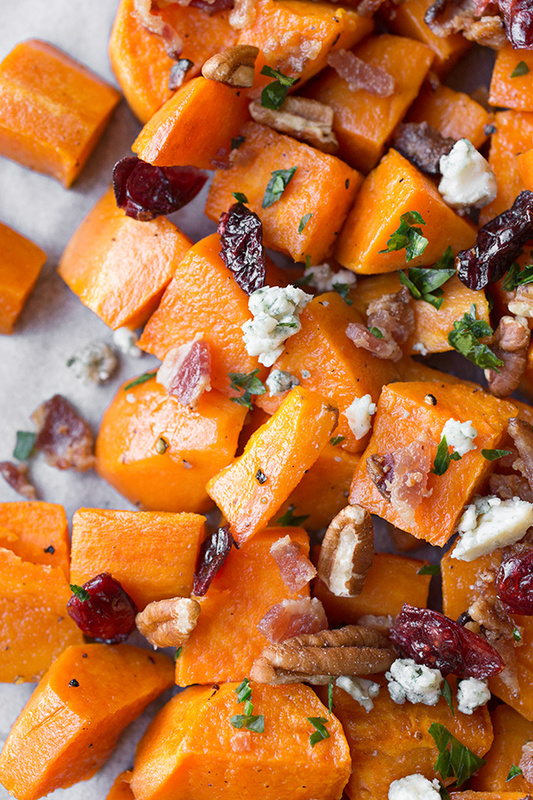 Thank you for this recipe do we cut the sweet potatoes into cubes raw and then roast them? Or do we boil then in water first and then roast? Thank you very much. Hi Adri! Yes, cube them raw and then roast them. Hope you enjoy! 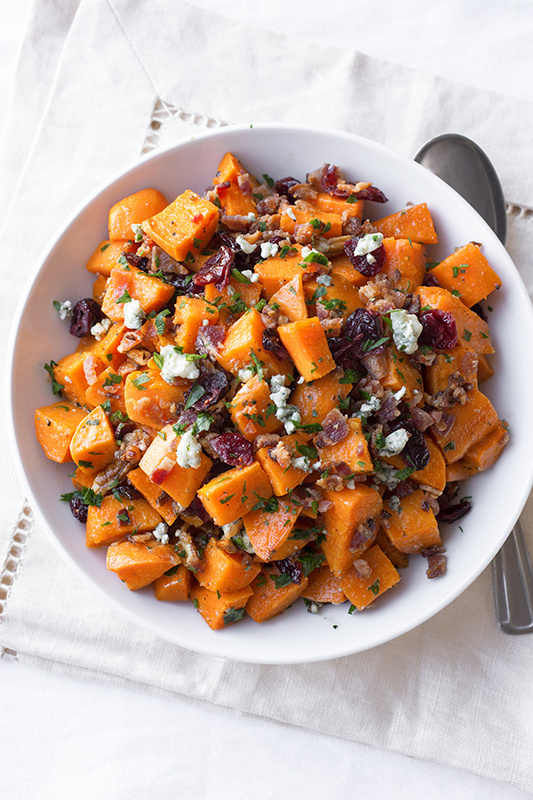 This Warm Roasted Sweet Potato Salad was AMAZING! I can’t thank you enough for sharing this as my husband was ha-ha-humming at the dinner table with this side dish. I did microwave the potatoes instead to cook and then just mixed everything together and it was still sooo good. This will now be cooked for potlucks and for my in-laws as it was so easy and makes me appear that I can cook! HAHA. I now trust that all your recipes are amazing and will be using many more. I will also be waiting for an Apple Crumb Cake 🙂 Thank you. 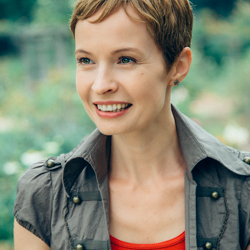 I would like to serve a meat barbecued……..what would you recommend?? Anything would pretty much go with this, Lorraine! Grilled chicken or even a good steak (flank steak is great cooked to medium-rare and sliced against the grain) would be tasty. Even burgers! Hope you enjoy. Very uplifting post! Thank you! This recipe looks delicious, minus the bacon for me but I am sure it would still work fine. Cannot wait to try it out ! Thanks Amy! Hope you give this a try!